The Monito del monte or otherwise known as the ‘mountain monkey’ is actually not a monkey at all but rather a small, mouse sized marsupial. This unique marsupial is widely regarded as a ‘living fossil’ be scientists as it is the last of an evolutionarily extinct family line. Sadly for these unique marsupials their population is starting to decline due to habitat loss which has led to them recently being classed as ‘vulnerable’. The Monito del monte is amasterful climber and is thought to be mostly arboreal, spending the vast majority of its time up in the trees. Although the Monito del monte looks similar to a mouse it can be identified buy its brown coast which is usually dotted with patches of ash or white colored fur. 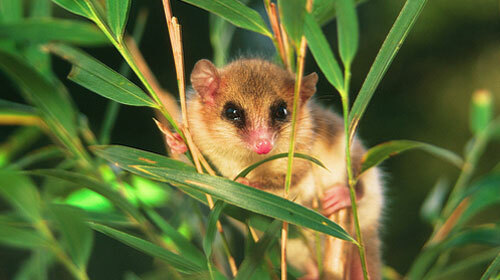 The Monito del monte has distinct black rings around its eyes and a tail that can be used to grasp when climbing. The tale of the Monito del monte can also store fat for the winter. The Monito del monte is found across Argentina and Chile and although at the moment they are fairly abundant covering a wide range the population is becoming fragmented and starting to decline. Although the Monito del monte is believed to be primarily arboreal they also build nests usually at ground level under rocks or in hollowed out trees which they will sleep in throughout the day, this is usually the only time the Monito del monte will spend at ground level. The Monito del monte’s nests are made from local resources such as twigs, leaves and mosses with bamboo leaves being a choice item due to them being water repellent. These nests can also be found up in tree branches similar to birds nests. 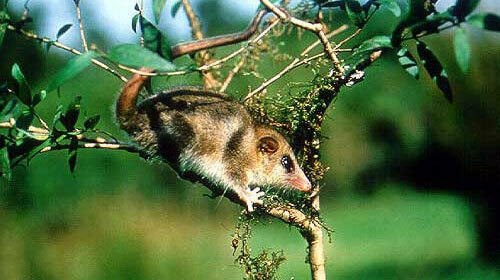 The Monito del monte hibernates through most of the year where it will live off of the fat reserves stored in its tail. When the Monito del monte is active its diet consists primarily of insects with occasional fruit. It is not clear whether the Monito del monte live in pairs or whether they are only seen in pairs during the mating season which is October through to December. The lifespan of the Monito del monte is believed to be around 2 years and its in this second year the the Monito del monte become sexually mature. After successful mating the female of the species will usually have 1 – 5 offspring which will be carried in the pouch before eventually becoming independant. Monito del Monte is my favorite pet like the small animals there great. I cannot believe how racist this animal’s name is! why pick on mexicans??? just because theyre different like me, doesent give YOU the right to make everyone feel bad and cry. I am extremely disappointed in the whole scientific community and demand the renaming of this animal. I am indeed sorry, but it is terribly wrong to think that “monito del monte” is in anyway offensive, obviously yo do not speak Spanish for “monito del monte” means small monkey from the mountains and it is simply a case of natives naming the animal after another animal that is not related to it, like koala bears, which are not bears. Also it is stupid to relate the name to Mexicans for the animal lives exclusively in Chile and Argentina. Did you know that they also speak Spanish out of Mexico and Spain? May I ask that you consult before so blindly criticizing? Have a good day. what is the thnic value?